Meet Chip - Cheerful Chip's Official Website! 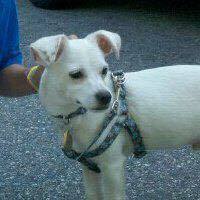 Chip was born in October 2009 and I rescued him from the MSPCA shelter in Methuen, MA during the summer of 2010. 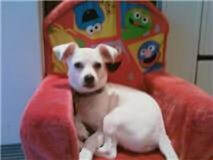 He is Jack Russell Terrier mixed with Chihuahua also known as a "JackChi" mix. From a very young age (8mo), Chip had a lot of energy and loved getting attention. I started teaching him tricks & practicing agility to improve our relationship and use his energy for something fun & productive. 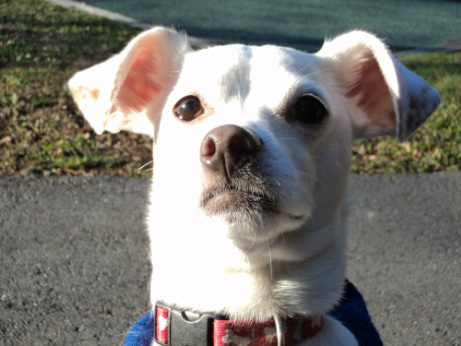 More recently, Chip has become a certified therapy dog and continues to make others smile with his adorable antics & charm. Playing chase or fetch games, taking long walks, going to the dog park, cuddling on the couch. Flies that buzz, when someone isn't scratching his chest, not getting a spot in my bed. A walking handstand & reading written commands!! Wanna see Chip in action? Come watch him on YouTube! Chicken, turkey, string cheese, & vanilla ice cream.